Saturday, Daddy took Joe and Charlie hiking with friends. 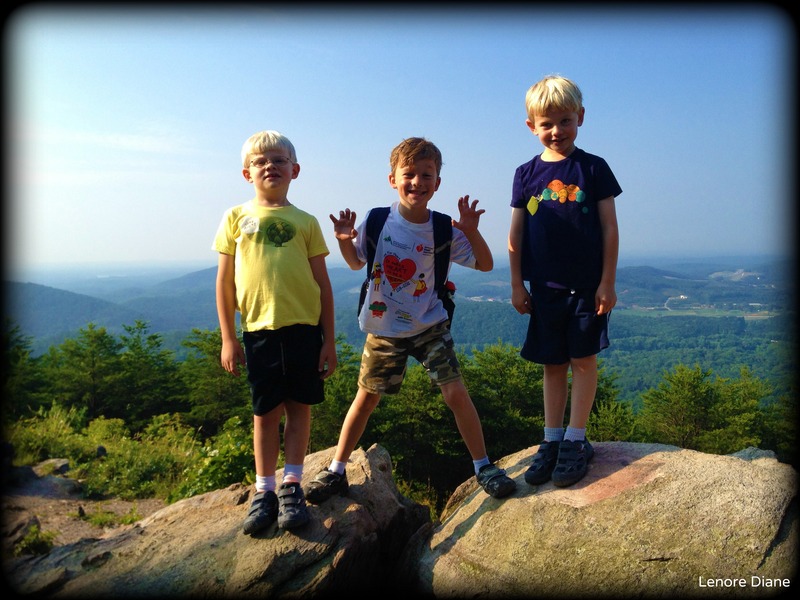 Today’s picture has the boys on top of Pine Mountain. May your view of the week be as lovely as the view from Pine Mountain. Thank you. Though I merely dressed up this particular picture. I was not hiking with the boys. The credit for this picture goes to the friend. Thanks for visiting. Ahh I love this one! What I wouldn’t give to be there right now! Me, too, Jules. I stayed home and spent the time doing chores. What a beautiful view (oh, and the scenery is nice, too!). Such cute little guys. Hee, hee. Thanks, Susan. That sounds like something my siblings and I would say. Just telling it like it is, Lenore. Omg, too adorable … lasting memories. I agree, Maxi. I am grateful for the lasting memories which are blessings. Thank you, Mags. The kids had a great time, and they enjoyed the view, too. Gorgeous–the view and the boys. I love the mountains! They did, Patti. Of course the rocks and bugs were distracting. What’s the elevation there, Lenore? It looks warm and cool at the same time. Hello Charles. The highest point on Pine Mountain is 1,395 feet. The morning was cool, but the temperatures rose quickly. So … you were right. Looks…and sounds lovely. Glad to see everyone looking hearty and hale.